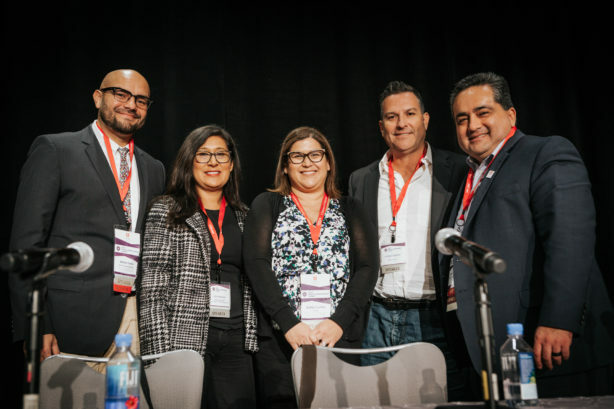 As part of its ongoing commitment to encourage the next generation of innovators and storytellers, The Walt Disney Company supported the 2018 Hispanic Scholarship Fund (HSF) Media and Entertainment Summit that took place November 15–18 in Los Angeles. During the conference, Disney leaders joined other industry professionals in sharing insights about entertainment and media careers with HSF scholars, who also had multiple opportunities to network with professionals during the event. Executives and leaders from across Disney’s businesses participated in sessions throughout the summit, addressing topics that ranged from recruitment and mentorship to innovation and global competitiveness. During the panel, “A World of Stories: Careers at Disney,” five leaders from The Walt Disney Company, The Walt Disney Studios, Walt Disney Animation Studios and ABC emphasized that thousands of professionals from a variety of fields are behind every movie and television show—and all play a part in telling those stories. The leaders—Julie Ann Crommett, vice president, Multicultural Audience Engagement, The Walt Disney Studios; Jose Velasquez, look development artist, Walt Disney Animation Studios; Ricardo Martinez-Guzman, director, Current Program, ABC; Marina Barreto, director, Business Planning & Strategy, ABC; and Fabricio Lopez, principal counsel, The Walt Disney Company—shared their personal experiences with the HSF scholars. They gave insights related to their current roles, diverse career paths and lessons learned along the way. The panelists also helped to shed light on Disney’s recruiting process and provided insider tips on how to successfully navigate the job market. Leaders from across the Company supported the event by providing remarks, participating on panels and supporting the career expo, including: Emmy® Award-winning executive producer Athena Portillo, Star Wars Resistance; Rafael Garcia, executive director, Original Series, Disney Channel; Araceli Coronel, Enterprise Talent Acquisition manager; Rafael Macias, vice president, Global Integrated Retail Sales; Sergio Baez, senior manager, Licensing, Disney Consumer Products; Juan E. Rodriguez, senior manager, Product & Portfolio Management, Disney Media Networks; Fabi Diaz, media planning coordinator; ABC Cable Networks Group; Alejandra Rodriguez Garcia, financial accounting analyst, The Walt Disney Studios; and Edgar Barillas, financial accounting analyst, Disney Consumer Products. Disney is committed to supporting students from diverse backgrounds who are pursuing their educational and professional dreams, and the Company’s ongoing partnership with HSF includes other programming, as well. Since the establishment of The Walt Disney Company-HSF Scholarship Fund in 2014, Disney has given a total of $2.5 million to create a scholarship program that provides high achieving students from distinguished universities the tools they need to succeed and make a difference for generations to come.